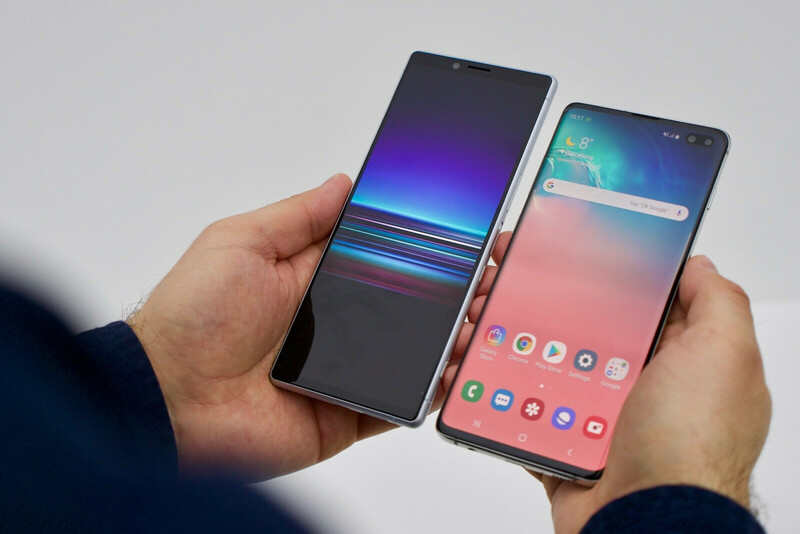 Samsung and Sony are two of the world’s biggest electronics manufacturers but when it comes to smartphones, Samsung is miles ahead of its Japanese competitor. We’ve looked into why Sony is doing so poorly on the mobile market, but now we’ll focus on its latest attempt to grab people’s attention with its flagship smartphone by putting it against the established force of the Android world: Samsung’s Galaxy S10+. We’ve had the opportunity to spend some time with both devices and already have some impressions about how they feel to handle and use for day-to-day tasks. 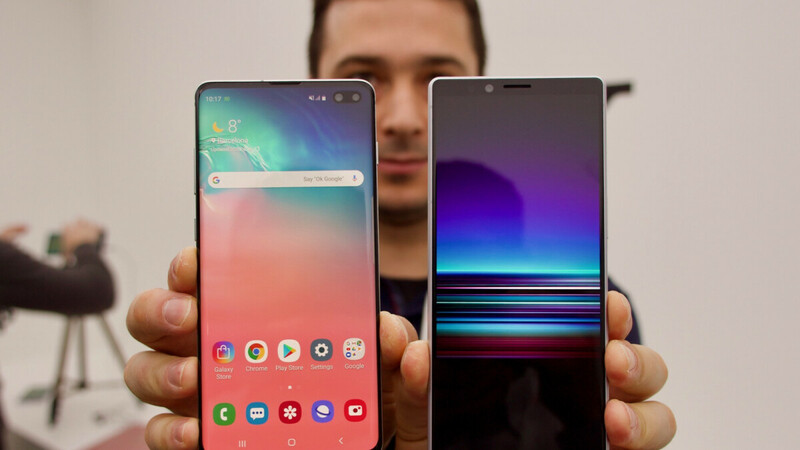 One thing becomes apparent right away: the Xperia 1 is freaking tall! The new 21:9 aspect ratio of its display combined with the top and bottom bezels (as thin as they are this year) add up to a whole centimeter more than the height of the Galaxy S10+. We wish we could say that the extra height isn’t a problem, but it’s actually quite noticeable. During use, the height of the display makes certain things almost impossible to reach comfortably. Also, good luck carrying the Xperia 1 in the front pocket of your jeans. Even if it doesn’t stick out of the pocket, walking or, God forbid, attempting to sit with it in your pocket feels awkward and uncomfortable. To top it off, you're constantly aware of the phone being there with the added worry of accidentally damaging it. Overall, though, we prefer the design of the Xperia 1 over that of last year’s Xperia XZ3. With its flat back and front, barely curved corners and unique footprint, the Xperia 1 will be hard to mistake for another phone. One issue persists through both designs, however, and that’s the fingerprint sensor placement. On the XZ3 it was on the back of the device but placed too low. On the Xperia 1, Sony has moved it to the side of the device, but despite having all that length to work with, the fingerprint reader is still positioned too low, forcing you to make weird hand movements to reach it. 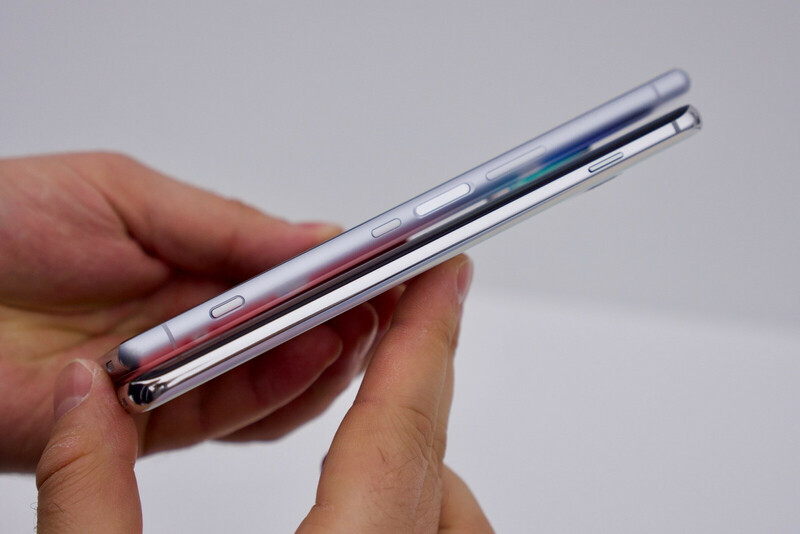 When it comes to the Galaxy S10+, the most surprising thing about it is how thin it is. Especially if you’re used to holding the S9+, the new Galaxy would feel almost like its missing something. The thinner bezels make room for an even larger display, which is always nice. Of course, there’s the pill-shaped punch-hole in the corner. We agree that it’s not the best aesthetic when it comes to selfie cameras, but you do get used to it rather quickly. The Galaxy S10+ has the infamous ultrasonic fingerprint sensor under the display, which is not only more convenient to use but adds some fanciness to the device since in-display fingerprint readers are still relatively rare. If we had to pick a winner in this category, it would have to be the Galaxy S10+. However, the Xperia 1 has a newly acquired character that might sway some people towards it. After all, that’s the benefit of having different brands to choose from! Time to look at the good old specs sheet. On paper, these two devices have plenty in common when it comes to components. With flagships all having fairly similar specs, it's all about how each device manages to use the hardware inside of it. But that's more for the software section, now let's compare some raw data. While the Xperia 1's display is with significantly higher resolution, on smartphones you eventually start to see almost no gain from adding more pixels and at the point where Sony stopped, it's just overkill. Samsung decided to settle with QHD+ resolution, which is more than enough for a display of that size. Both are OLED displays, but we can confidently say the one on the Galaxy S10+ looks a lot better in person. Samsung has been the top dog when it comes to mobile displays and the ones on its latest flagships make no exception. Both phones are powered by the Snapdragon 855 Mobile platform, which means performance-wise they should be about equal. The Galaxy S10+ has a slight upper-hand thanks to the extra 2GB of RAM it has, but 6GB will satisfy the needs of 90% of the users anyway. Still, more is better so point for the S10+. Rear camera setups are also comparable, as Sony and Samsung opted for the Regular+Ultra-Wide+Telephoto cameras. The Galaxy takes a slight advantage here as well for the 4 extra megapixels its ultra-wide sensor has. We'll need to take some proper camera samples with each of the six total cameras before we can confidently say which one performs better. At the front, yet again, the S10+ has a bit more to offer than the Xperia 1. This time it's a secondary camera that's used only for depth-of-field data, which should make any portrait-mode selfies made with the S10+ better. Again, further testing is needed for comprehensive results, all in due time. A difference we were surprised to notice is missing from Sony's flagship's specs is face unlock. Even if it's not as secure as the fingerprint sensor, it's a very convenient feature that even some budget phones have now. It's possible that Sony will add it before the Xperia 1 is available for purchase. The final significant specs difference is the battery size. The 3,330mAh one on the Xperia 1 is not exactly small, but considering the size of its display and the pixel density, it might be one of the phone's weak points. Meanwhile, the Galaxy S10+'s body is not only smaller and thinner than the Sony but packs an impressive 4,100mAh battery! 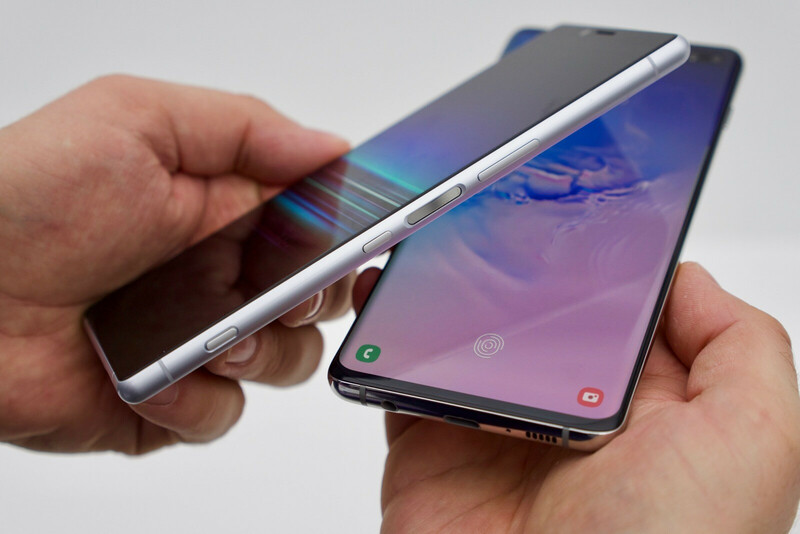 This alone shows how much effort and resources Samsung has poured into the development of the new Galaxy S10 phones and is now deservedly reaping the rewards. Related to the bigger battery is another nice feature the Galaxy S10+ has that the Sony lacks: reverse wireless charging. Granted, it's not going to be something you'll be using daily, but when the need arises it's better to have it than not. A big asterisk before we start talking about the Sony. Its software was obviously not in its final stages since the phone doesn't even have a release date yet so it will be unfair to compare it to that of the Galaxy S10+, which will start shipping in just a couple of weeks. 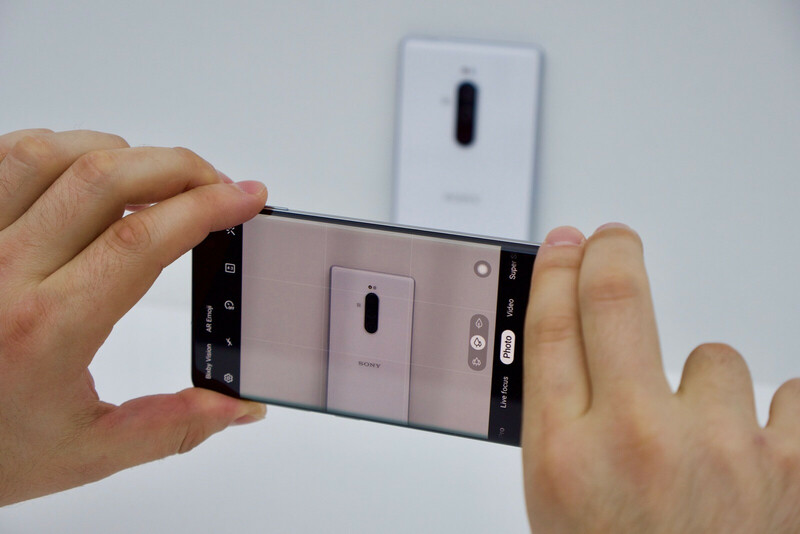 We did, however, get to try for ourselves some of the new features of the Xperia 1 that were mentioned during its presentation. We particularly liked the camera's Eye AF (autofocus) feature. It worked well when we demoed it and we're looking forward to testing it more once the device is officially out. Another new feature coming on the Xperia 1 is the Cinema Pro video recording app. It offers plenty of adjustable settings, preset "LOOKS" with different color gradings and all sorts of other things to tinker with. While it might prove to be super useful for a fraction of Sony's userbase, most Xperia 1 owners will likely open it once just to see what it is and never use it to make "cinema-like" videos. Speaking of cinema, the 21:9 display shines not only when watching videos with that aspect ratio, but also for more common tasks as browsing sites, since you don't have to scroll as much. And when you're playing games, the wider view helps to keep your thumbs away from the action, which we give a thumbs up! In Samsung's corner, things are as polished as they'll get. One UI is bringing a fresh new look to the high-end Galaxy phones and soon users will even be able to remap the Bixby button to whatever function they want. Speaking of Bixby, the Galaxy S10+ camera has integrated AI scene recognition and you also get Bixby vision, which lets you quickly get information about whatever your viewfinder is pointed at. When we draw the bottom line it's pretty clear that the Galaxy S10+ is the superior device. That doesn't mean that the Xperia 1 is headed for the trash can, however. Depending on how Sony decides to price its latest flagship, it might turn out to be a good deal. Sadly, if we take a look at Sony's history, we shouldn't have high hopes for that to happen, but there's still a chance that the tech giant will change its ways. Fingers crossed! It smells biased. The display is a personal choice.. I don't know but last year's XZ3 had a better screen than most flagships according to most sites..how come the 4k oled is worse than S10s? You all are pathetic.. period.. Joke in the name of journalism. Ads for Samsung, they have far more money for marketing. Youtube is even worse. Samsung has consistently put out the best displays on the market. It isn't biased and pathetic journalism for them to state their opinion, especially when it's one that's well grounded with historical data. Maybe because display specific tests have always shown samsung flagships to be well calibrated and highest performing. Lol dude.. Last year's strategic analysis said that over 70% people after seeing the displays of various phone said that xperia xz3's display was better.. And yea most of the tech channels, they are often biased... People want an honest opinion that's why they approach reviewers and then they give us biased reviews.. I believe that Front Facing camera information is wrong. I wish someone in their review will explain how does it feel holding the Galaxy S10+. I pre-ordered the S10 512GB, because these big phones are becoming too unwieldy. I hope the battery life is good enough for the smaller S10. I don't take selfies, so the extra FF camera means nothing too me and I think the 6.1 inch screen size is big enough. Battery life and the lack of a vapor cooling system, like in the S10+, are my only concerns. Samsung executives says difference in battery capacity is to compensate for different screen size. His exact words where " No matter what phone you choose you will have the same battery life". Although lack of vapor cooling is somthing I am concerned about. Sony, Big screens need big batteries, 3300mah is okay but for your flagship, that a downer in 2019. I was a great big fan of Sony's phones. But Sony just seems to lack.......something. Their devices are almost there. Almost. I'm still hoping on them though. Maybe one day I can leave my Samsung Notes abd go back to an Xperia. One can hope. Kind of mixed on both. Think I'll pass and see what else is offered. For the S9s and now S10s to be so thin and still 'manage' to fit headphone ports continually proves their removal is purely a profit margin move. I'm pretty sure my old S6e is thinner and smaller than most of the junk coming out these days and it had one anyway. If it was practical to replace the battery on that almost four year old model it'd still be a worthy daily driver. 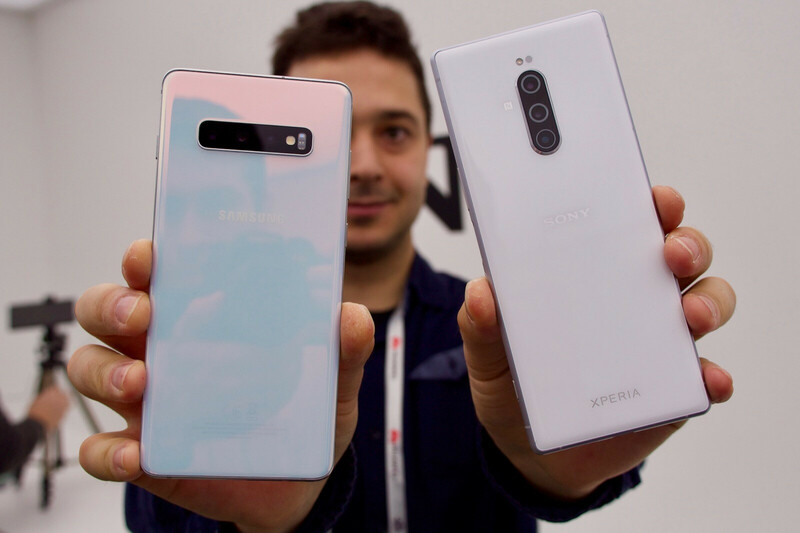 If the Sony Xperia 1 was the same height as the s10+, it would have been the best looking Sony device out there. You guys are tech journalist, if I am right you guys specifically review phones, why do you have lot of spec related mistakes all over your site(s10+ front cam). This is not the first time I am noticing this please get your s**t together. Sony is dead , I had Sony Xperia sl on 2012 it was a piece of garbage, super sluggish whenever I wanted to make a phone call it halted and I had to press the call button several times but it did nothing! finally after an hour or sometimes more than an hour it called the destination several times when it was in my pocket! it was taking picture in my pocket by itself too I remember I had several blackish dark pictures in my gallery all the time! It was an awful gadget. the batter was awful too. I believe Sony phones are so expensive too, meanwhile you can have a much much better gadget from Samsung or Huawei with the same price or even cheaper . I will never ever buy a Sony phone and I will never suggest to any of my friends to buy Sony neither! one suggestion for Sony: :-D please stop making expensive s**tty phones and focus on Play station pleassse!